The whole concept of brokenness can be intimidating and threatening, especially once you start to discuss it with others! We all face the common temptations to be more concerned about what others think than about what God thinks, to fear our needs or failures being exposed, and to sinfully compare ourselves to each other. Be aware of these temptations and ask God for grace to cultivate an atmosphere of humility and transparency in your group. Respect God’s work in one another’s lives, by not discussing each others’ struggles or sins with those who are not a part of the process. As you open your heart to the Lord and to those in your group, remember that brokenness and humility are the keys that will unlock some of God’s richest blessings in your life and relationships. This guide provides suggestions for discussing Brokenness with others. But hopefully, your time together will not just be for the purpose of discussion, but for the purpose of spiritual growth! Ask the Lord to do a deep, penetrating work in the heart of each group member, and to show you how to apply these truths to your life. The objective is not to master the message of this book, but to let this message master you and to be transformed into the image of Christ. Keep your focus on Christ and the life-transforming power of the gospel, for apart from this glorious hope, your efforts to change will produce mere self-righteousness or even greater failure and frustration. Open and close each meeting by praying together. Ask the Holy Spirit to guide you through the Word, to help you be real with one another, and to bring about any needed change in each heart. Seek to lead by example. You can serve your group best by modeling personal humility—being the first to confess your own sin and the first to encourage others in God’s grace at work in them. Some of the questions in this discussion guide call for a level of transparency and openness that many people are not accustomed to. Encourage the members of your group to respect each other’s privacy by not discussing others’ contributions outside of this group. Remind them that God is patient and gracious with us as He conforms us to the image of His Son, and that we need to extend the same patience and grace toward each other. This discussion guide is designed to be used in a variety of contexts—from small groups to Sunday school classes. Feel free to direct the discussion based on the size of your group and the allotted time. Avoid rabbit trails into secondary or unrelated issues. However, don’t feel pressured to get through all the questions each time you meet. Depending on your available time and the size and openness of your group, you may end up only discussing two or three questions. The goal is to grow together in your understanding of God and His ways and to experience individually and as a group the reality of the message of this book. Keep your group centered on the truth of the gospel: We are all sinners in need of a Savior. Help your members steer clear of self-righteous responses to the confessions of others in the group and from condemnation about their own performance by pointing them to the One who is both the author and perfecter of their faith (Hebrews 12:2). What motivated you to read Brokenness or to be a part of this group? What, if any, fears or reservations have you had about doing so? Read aloud the prayer found in the front of the book from The Valley of Vision—either as a group in unison, or have one or more individuals read while others listen. How does this prayer illustrate that God’s thoughts and His ways are different than our thoughts and our ways? 1. Have you ever been in a setting that you would describe as true revival among a group of God’s people? Describe briefly what it was like. 2. What things stood out to you in the account of what took place at the Campus Crusade gathering in July of 1995? What were the marks or characteristics of that gracious visitation of God’s Spirit? 3. Have you ever experienced the kind of intense conviction over sin that took place in many who participated in the Campus Crusade gathering? What was He illuminating in your life and what was the fruit of it? 4. What was your response to the description of the public confessions that took place? In a similar setting, do you think you would have participated or hung back? Why? 5. “[Humility] is God’s prescription for nearly every condition that ails human hearts and relationships” (p. 25). What Scriptures come to mind that support this point? Why do you think this is the case? 6. “Throughout that vast auditorium, hundreds of men and women humbled themselves before God and before one another. Husbands and wives, parents and young people, colleagues, supervisors and subordinates—people got serious about being honest with God and with each other. Over the next few days, long-standing grievances were confessed and breaches were reconciled—some of them going back for decades . . . Pretense and masks were stripped off in His presence” (p. 22). Try to imagine what it would be like if millions of God’s people throughout this country and around the world were to humble themselves in this way. How would our churches be different? How would our homes be different? How would your life be different? What would be the impact in the lost world? Page 25 list a number of problems/issues that have their root in pride—but which can crumble through genuine brokenness and humility. Identify any of those issues you see in your own life. In the coming days, note any passages you encounter in the Word where the Lord either addresses that matter directly or promises to help you change by His grace. Be ready to share those items with the group next time. The Introduction closes with a reference to the perspective in the prayer from The Valley of Vision —that the way up is down, that death brings life, and the broken heart is the healed heart. This might be an uncomfortable concept for you, but God promises to pour His grace on the humble . The very thing we naturally resist—being humbled—is precisely what will produce the blessings we long to experience and that He longs to give us. Your assignment last time was to identify specific issues in your life or relationships that could be rooted in pride, and to be alert to biblical passages that address those areas. Spend a few minutes sharing what God may have shown you since your last meeting. 1. By all appearances , Wayne and Gwyn Stanford were “good Christians” before the experience they described in 1982. Based on their subsequent testimony, what was wrong? How would you describe their true condition at that time? 2. Either now or in the past, can you relate to anything about Wayne’s or Gwyn’s spiritual condition prior to their encounter with God in 1982? 3. Can you recall a time when your relationship with someone was hindered by your pride or anger? How was it resolved? 4. In order to appreciate the gospel and the One who is our Savior, we must come to see ourselves as “sinful and desperately needy of God’s grace” (p. 33), as Gwyn did. Describe one such moment in your life, either at the point of conversion, or subsequently. 5. What was the fruit of that moment? How has the grace of repentance affected your relationship with God? 6. In Gwyn’s case, she realized that “in spite of her religious appearance and activity, she had never been truly born again” (p. 33). Do you think this is a rare or a common condition in the church today? Why might it be more common than it should be? 7. Why does the Scripture put such an emphasis on the heart , rather than mere external appearances? 8. What were some of the changes that took place in Wayne’s and Gwyn’s lives after God transformed their hearts (pp. 37–38)? 9. “What about you? What is the condition of your heart?” (p. 39). If you feel the freedom, share an area of your life where the outward appearance is satisfactory, but God knows—and you know—that your heart is not what it should be. Then take time to pray for a fresh work of humility, grace, and revival in each others’ lives. At the close of the chapter, you were encouraged to make an appointment with the Great Physician to ask Him to examine your heart, according to Psalm 139:23—“Search me, O God, and know my heart.” Before the next meeting, set aside some time to do this; wait quietly on the Lord and let Him show you what He sees. Then read Psalm 32:1–4 to be reminded of how God responds to those who humble themselves and confess their sin. As you do this assignment, and throughout this study, you may be surprised to find the Holy Spirit showing you areas of your life or certain motivations or heart attitudes that you had not considered before. Remember that the Great Physician does not uncover or expose us without intending to heal and restore us. It is a Father’s loving correction that is at the heart of any “diagnosis” you may receive in this homework assignment. Chapter Two: What Is Brokenness? Chapter Two uses the analogy of a horse being broken. Has anyone in your group actually ever broken a horse or seen it being done? What was it like? Did you set aside time to hear from the Great Physician? What did He reveal to you? How have you responded to that “diagnosis”? 1. What was your idea of brokenness before you started reading this book? Did you have any misconceptions? How did this chapter help you gain a better understanding of true brokenness? 2. Why do you think we have a natural aversion to the concept of brokenness? Why might some people be afraid of brokenness? 3. What do you know about God and His ways that could help alleviate those fears and should motivate believers to choose the pathway of brokenness? 4. Read James 4:6–10 together. Discuss the contrast between this passage and the prevailing way of thinking in our culture. What evidences and results of pride do you see in this passage? What evidences and results of humility? 5. What is meant by “roof off, walls down”? Which do you think is more difficult? Why? Why are both important? 6. What insights about the process and fruit of brokenness can be gleaned from the account of Jordan in this chapter? 7. Are there areas in your life that are still dominated by self-will? Do you see that affecting your relationships with others? 8. How has this chapter affected your view of God and His work in your life? Share a specific area of spiritual need, sin, or area of recurring defeat in your life, and ask that person to pray for you. Ask your friend to share any specific area(s) of concern that they have about your life—perhaps a “blind spot” they may have observed. If you’ve not done this before, you may want to do two things: (a) Ask God for the grace to receive their input with humility; (b) Assure the person you ask that you really desire to know the truth and will not become offended at their remarks. Generally, it’s a lot easier to see areas of weakness or pride in others than to see them in ourselves! If you’ve never asked anyone close to you for observations about your character or areas that need change, you may be reluctant to do so. But remember that spiritual blindness is usually unilateral. Others can see clearly those things we may not recognize about ourselves or may be unwilling to address. Asking for honest input into our lives is a way to demonstrate the horizontal dimension of brokenness, and usually strengthens our relationships with others. Hard as it may be to open our hearts to others or receive candid feedback, it provides an opportunity to humble ourselves. Remember . . . you can never go wrong on the pathway of humility, because God promises to pour out His grace on the humble! Think about the way we tend to measure or categorize sins. What are some sins we usually think of as “big” sins? What are some sins that are generally considered relatively insignificant? How is God’s perspective on sin different than ours? How did God meet you as you asked someone close to you for observations about any blind spots in your life or you shared a spiritual need and asked someone to pray for you? Did this step of humility strengthen your relationship with that person? How did this step affect your relationship with God? 1. In this chapter, we “unpacked” some well-known biblical accounts and parables and examined them through the lens of pride and humility. Did you gain fresh insights into any of these stories? 2. This chapter draws attention to several biblical illustrations that contrast broken people with proud people. In each of those “pairs,” the difference was not so much in the magnitude of their sin, but in their response when confronted with their sin. Can you think of a time when you responded in pride when confronted by God or another person over your sin? What did that look like? What would a humble response to reproof look like? 3. In some of the biblical characters we considered in this chapter, we saw the effects of a proud, unbroken heart: blindness toward their own sin and their need for a Savior, criticism of the message and the messenger, an inability to rejoice when others repented, and a lack of joyful worship. Did any of these points “hit home” with you? If so, in what way? 4. “Jesus was always drawn to those whose sin seemed to be more egregious (from a human point of view), but who were repentant over their sin. On the other hand, He was repulsed by those who looked like perfect saints but whose hearts were proud and unbroken” (p. 79). Why do think this is so? How is this different from the way we often view people? 5. By its very nature, pride tends to make us blind to the fact that we are proud. What are some ways we can be helped to identify more clearly the pride in our lives? Make a list of the evidences and effects of pride you discover in those accounts. Our failure and need should always cause us to turn to Christ, who is God’s only and all-sufficient provision for our sin, through His death on the cross! Remember, too, that God doesn’t reveal anything to us that He does not intend to change by His grace. In those moments, we need to remember that through these revelations our Father is lovingly conforming us to the image of His Son. Chapter Four: Am I a Proud or a Broken Person? This chapter opened with a story about how the national believers in one region of Africa would inquire when hearing of another believer, “Is he a broken Christian?” That question would probably seem strange to most Christians in our culture! What kinds of questions are we more likely to ask? What evidences or characteristics of pride did you discover in your study of Jesus’ encounters with the Pharisees in the gospel of Luke? How does that help us understand why Jesus and the Pharisees were always at odds with each other? Did God point out any of those same evidences in your own life? 1. What qualities would cause you to say of another person, “He/she is a ‘broken’ Christian”? 3. If someone who did not know you were to ask your friends, family members, or co-workers, “Is [your name] a ‘broken’ Christian?”, how do you think they would respond? 4. Close your time in prayer. Confess any pride you are recognizing or struggling with in your own heart; pray for a broken and contrite heart; pray for God’s grace to be poured into the lives of others in your group, as they humble themselves before Him. Take time to pray over this list (even if you’ve done so before!) and ask God where He wants you to start receiving His grace to change and applying His Word to at least one specific area of your life. Share what God shows you with someone in your group or another accountability partner and ask for prayer in that area. “If this list has helped you realize that you are a proud, rather than a broken, person, do not despair. God has been merciful to show you your need” (p. 94). Thank God for loving you enough not to let you stay the way you are! And thank Him that He not only exposes our need, but that He also supplies us all the grace we need—both the desire and His supernatural power—to transform us and to enable us to live a humble, Christ-like life. Therefore, “humble [yourself] in the sight of the Lord, and He will lift you up” (James 4:10)! Has anyone in your group ever had to let a doctor break a bone in order for it to be reset properly, or watched someone else go through that experience? What was it like? Was it worth the pain? With regard to one area where you are seeking to change with God’s help, how have you experienced His grace since your last meeting? 1. The concept that “brokenness brings blessedness” runs counter to our natural thinking. What does the enemy want us to believe will happen if we humble ourselves? 2. Review the five blessings of brokenness highlighted in this chapter and comment on any that you particularly desire or need in your life. 3. How does each of the following illustrate the principle, the process, or the blessings of brokenness? 4. How does Melanie Adams’s testimony illustrate the following “cycle” (described on p. 110)? Describe how you have experienced some aspect of this cycle in your life. 5. Who do you know (or know of) who has become a more effective, fruitful servant of the Lord as a result of being broken? 6. What is the connection between brokenness and personal or corporate revival? How is pride a barrier or hindrance to true revival? 7. “The greatest hindrance to revival is not others’ unwillingness to humble themselves—it is our need to humble ourselves and confess our desperate need for His mercy” (p. 118). Can you identify any way(s) that your pride may have been a hindrance to revival? As God prompts, share with the group any specific ways that you know you need to humble yourself before Him or others. “Have you been waiting for your mate or children or church leaders to humble themselves so there can be revival in your home or your church? God may be waiting for you to humble yourself . . .” (p. 118). Is there any situation or relationship where you need to take the initiative to humble yourself, rather than waiting for the other person to change or move? If so, would you be willing to follow the example of Melanie Adams and take that first step? It’s worth stating again: Brokenness brings blessedness (Matthew 5:3)! Sometimes what it takes to humble ourselves may seem awkward, difficult, or embarrassing. However, it is always more than worth it to obey God and choose the pathway of brokenness. How has this study been helpful to you? In what ways have you found it difficult or challenging? What is one “blessing of brokenness” you have experienced since you started this study? 2. How has God used His Word, circumstances, or His people as an instrument to help bring about greater brokenness in your life? 3. Seeing God as He is helps us see ourselves as we really are and results in deeper contrition and humility. What are some ways we can get a fresh vision of God’s awesome holiness, power, majesty, and love? 4. As is illustrated in the Afterword, sometimes our greatest defeats and failures can come on the heels of our greatest victories. Why might that be the case? Can you think of a time when that was true in your own experience? 5. We have seen that brokenness is not a one-time, crisis experience, but a way of life. What might a “lifestyle of brokenness” look like in practical terms? What are the greatest obstacles or hindrances to that kind of lifestyle? 6. Numerous examples have been given in this book of individuals choosing to “walk in the light” with God and others about specific sins or issues in their lives. Is there any area of darkness in your life that needs to be brought into the light? Anything you know God wants you to do that you have been resisting? Any specific step of brokenness that the Lord put on your heart as you read this chapter? It will never be easier to take a step of brokenness than with a group of friends who love you and are aware of their own need for humility. As God prompts, take time to share those areas openly and honestly within your group and to have the group pray specifically for each one who shares. Though this concludes your study of Brokenness: The Heart God Revives, it may be just the beginning of a new walk of humility. In the days ahead, you will face many opportunities to choose the pathway of brokenness, each created by our sovereign Lord who also promises that His grace is sufficient for anything and everything He requires of us. Never forget that whatever God commands you to do, He will also enable you to do. As you “walk in the light” with Him and other believers, remember that His light not only exposes our ugly sin and pride, but it also shines on the person and the cross of Christ. As His cross is brought to bear in our lives, we will experience the joyful fruit of brokenness and experience true revival. Close your time by reading aloud again the prayer from The Valley of Vision found at the beginning of Brokenness . Nancy DeMoss Wolgemuth has touched the lives of millions of women through Revive Our Hearts and the True Woman movement, calling them to heart revival and biblical womanhood. Her love for Christ and His Word is infectious, and permeates her online outreaches, conference messages, books, and two daily nationally syndicated radio programs—Revive Our Hearts and Seeking Him. She has authored nineteen books, including Lies Women Believe and the Truth that Sets Them Free, Seeking Him (coauthored), and Adorned: Living Out the Beauty of the Gospel Together. Her books have sold more than three million copies and are reaching the hearts of women around the world. Nancy and her husband, Robert, live in Michigan. Please note: by submitting your information to receive this resource, you are agreeing to receive future communications from Revive Our Hearts. You can unsubscribe at any time. 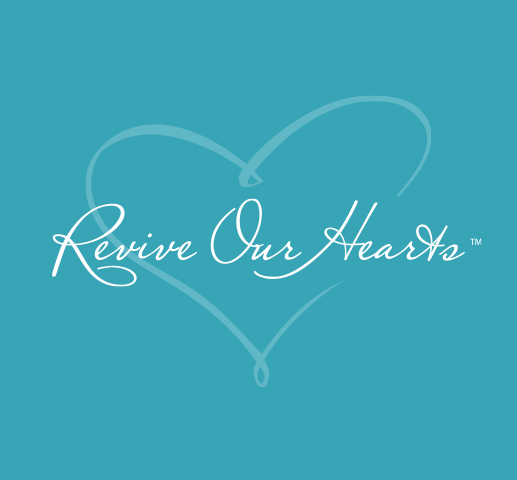 Revive Our Hearts is an outreach of Life Action Ministries.